The classical yeast two-hybrid system and its modifications have been successfully used over the past decade to investigate interactions between most classes of proteins expressed in a given cell or tissue. However, some proteins (e.g., integral membrane proteins or nuclear proteins) are relatively difficult to investigate by standard yeast two-hybrid methods either because they are retained at cellular membranes or they activate the system in the absence of a true protein interaction. The membrane-based yeast two-hybrid (MbY2H) system presented in this unit overcomes some of these limitations. It is based on the split-ubiquitin protein complementation assay and detects protein interactions directly at the membrane, thereby allowing the use of full-length integral membrane proteins and membrane-associated proteins as baits to hunt for novel interaction partners. A simple modification also allows the use of proteins that are self-activating in a classical yeast two-hybrid system (e.g., acidic proteins and many transcription factors). Like the yeast two-hybrid system, the MbY2H system can also be used for interaction discovery by screening complex cDNA libraries for novel interaction partners. 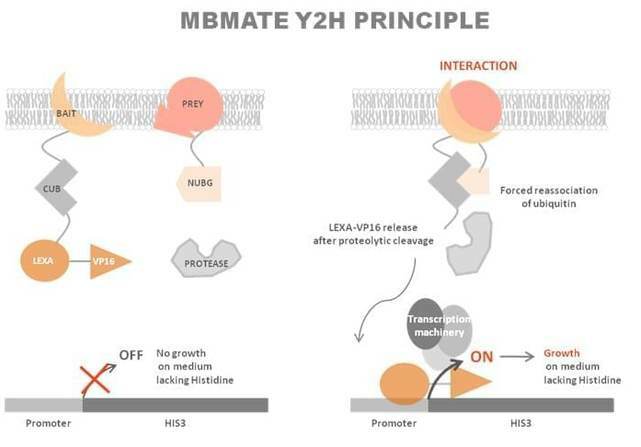 MbY2H takes advantage of the observation that ubiquitin can be separated into two stable moieties: the C-terminal half of yeast ubiquitin (Cub) and the N-terminal half of the ubiquitin moiety (Nub). In MbY2H, this principle is adapted for use as a 'sensor' of protein-protein interactions. Briefly, the integral membrane bait protein is fused to Cub which is linked to an artificial transcription factor. Prey proteins, either in individual or library format, are fused to the Nub moiety. Protein interaction between the bait and prey leads to reconstitution of the ubiquitin moieties, forming a full-length 'pseudo-ubiquitin' molecule. This molecule is in turn recognized by cytosolic deubiquitinating enzymes, resulting in cleavage of the transcription factor, and subsequent induction of reporter gene expression. The system is highly adaptable, and is particularly well-suited to high-throughput screening It has been successfully employed to investigate interactions using integral membrane proteins from both yeast and other organisms. As a leader specialized in protein interaction analysis, Creative BioMart has acquired extensive experience and expert knowledge in protein interaction study. We will be glad to discuss details of intended interaction studies with you and develop experimental strategies/methods tailored to your requirement. Please get in contact with Creative BioMart for more information or a price quote.